Altered Alchemy : OWOH ... YAY!!! i am a little silly ... but essentially, i'm a dreamer :) i live in middle earth most of the time (only occasionally returning to Malaysia ;) i have 2 beautiful daughters ... Llara Kaye is 5+ and Maia Fae, my little preemie is reaching 4 months already!! and she's now 4kg :) woohoo!! i love to make things ... i dream them and then make them ... from handbound books to jewelry to housewares. i dabble in all sorts, polymer clay, acrylics, paper, metal ... but my love for now is mixed media and assemblage. and rust! i am experimenting with (organically) rusting my own objects for my assemblages. and it's such a lot of fun! i am inspired by old world romance, uncharted voyages and adventure stories. i am in love with found objects, distressed surfaces and rusty stuff. i believe in magic, middle earth and elves. It is said that when the Age of Man begins, the elves would fade and return to the Ancient West. Athelia is inspired by the Grey Havens, the harbor where the last of the elves of Middle Earth would embark on their final journey home to Valinor. - The pendant is made by me, using several different materials namely polymer clay, aluminum wires, color coated artistic wires and acrylics. The clay bead is au-natural, wet-sanded smooth and buffed to a matte-satiny sheen. - The cord combines ocean jasper beads, non tarnish silver coated wires, fibres, metal caps and spacers. This is a set of 6 blank cards, laser printed on high quality textured cardstock and comes with 6 pieces of A5 envelopes. The images on the cards are images of some of my previous/current work with mixed media and assemblages. WOOHOO!!! let the fun began!! the drawings are now closed :) thank you for playing!!! Oh what a gorgeous blog! Love the design, love the title and your artwork...awesome! I love your Book of Celts!! I am a new follower so I can explore your blog after the OWOH. Very inspiring! Also would love to enter your give away, beautiful doorprizes! I am also participating in this OWOH. Hallo Luthien,great you join OWOH tooThank you for giving us the chance to win your great doorprice. This is really beautiful.You know, I love your unique jewellery and books and all of your creations. And I would love to win that. Such interesting work! I am very happy to meet you - and I wish I could send you some of my snow!! I enjoyed visiting your blog and hope you will visit me, too! Thanks for the chance to win either your beautiful necklace or a set of your cards -- such lovely prizes. For some now, go over to my blog. Besides, you are welcome any time to shovel snow in winter. Hah! Your work is so beautiful - I am really enjoying your blog (and even bookmarked a tutorial to try)! This is fantastic. a really great blog and givaway! Your name is beautiful and so are your giveaways! I collect hearts (any shape and design) and would adore to own this necklace! I love the twisty look you created. All your gift are so generous...thank you! Please put my name into the drawing. I'd be honored to win! And if you want snow, I'm in Colorado and have plenty to share! OWOH is a great trip around the (blog)world, thanks!! I don't normally leave comments for blog giveaways but wow these are SO beautiful I can't help myself. Great talent! Gorgeous work! I can only hope to be the one that ends up getting to wear this beautiful piece of art. You cards a super cool too! So glad our paths have crossed because of the OWOH event! How beautiful! It looks SEWN! Isn't this just a wonderful week full of celebrations? Hi Luthien, Love your site and your work. The neck piece is absolutely gorgeous! I love all things Elvish and of Middle Earth. I'd love a chance to win one of your pieces, please enter me in the drawing. Greetings from Virginia, US! Thanks for your giveaway. I'd love to win one of your lovely prizes. Please feel free to visit my blog and enter my contest. I love your style! I was drawn to your blog because of your location (I"m visiting as many different countries via OHOW as I can), but I"ll definitely be back because I love the materials you use and how you incorporate them. Would love to win your prize! Awesome blog! You are very creative and I love your style! I would be thrilled to win! your artwork is beautiful, so please add my name to your drawing! I love your blog! And your etsy shops is fantastic, I think I need one of those beautiful journals! What gorgeous things you are offering for your gifts! Glad I stoppedby. Stop by my blog to see the bead woven necklace that I am offering. Simply stunning! Love the blog! And I have a former premie too, he was born at 24 wks and weighed 1 lb 2 oz, he was itty bitty, but he is 3 now and up to 36"tall and 28lbs. Thanks for the opportunity to enter your giveaway and please drop by and enter mine. As if I'm going to miss the chance of entering this!! Greetings from the UK. I would love to win your beautiful necklace - it's lovely. Please throw my name in the hat for a chance in your drawing. Hope you can stop by my blog. Hi, nice to meet you. I'm 96 on the list and from CA. Hope you are having fun with OWOH. This is a great giveaway, please enter me and stop by my blog for a chance to win too. Enjoy yourself and thanks. Hello From Ky! Stopping in for a visit from the OWOH Bloggers Event! So Many Talented and Creative Bloggers out Here! Only one way to describe you giveaways ~ breathtakingly beautiful! I hope you'll visit my blog too (Art of Humungous Proportions) when you get a chance. Oh so pretty! Thank you for taking the time to offer this lovely gift and thank you for the opportunity to win! Happy OWOH to you, and thank you for sharing your talents! You have an amazing amount of talent. I love seeing things you've done in so many different mediums. Fabulous! oh, this is so pretty! what a lovely giveaway! please add me to the draw. if you have a chance I would love it if you would come by my blog, #437! So many gorgeous things you have here! oh so charming! kung hei fat choi! HOP-py year of the rabbit! What amazing giveaways - very generous of you! I'm drooling over both! Oh my gosh...this is beautiful work and a lovely blog too! WOW! What a cool place to pop into on the OWOH journey! Please stop by my blog if you have a minute and I can pop your name into my giveaway too! One of my favorite things about blogland (and life) is meeting friends from other countries. Right now, I am trying to focus on international swaps. They are so much fun. Your blog is lovely and your craftwork is incredible. My daughter and I make jewelry so I really appreciate what you have done with the silver piece. I would love to own either!! Hope you'll stop by for a visit! Hi Luthien! It is wonderful to meet someone from your beautiful and warm country throught this sweet OWOH adventure. I love the pieces you have offered as gifts. Thanks so much for the chance to win. I hope you have a sweet flight ! Me, me I want to join in, love, love, love to win one of your wonderful creations. My OWOH post is set up just need to sort it out with Lisa first. Please pop in if you would like to when you can! I am so happy that little Maia Fae is doing well, will pop by again soon to catch up! Your work is amazing... sooooo cool. Love your blog and will definitely be back to drool over the images of your books and jewelry. Please enter me in your drawing. Beautiful blog, I am so glad I stopped by, what a delight! I love your creations and I added your profile to my flickr contacts. Great tutorials, I am going to try making some natural papers and the pearl clay beads. And as for Snape... I can say I too was a believer! Oh my goodness. what beautiful work. i'd love to have that necklace hanging around my neck, love the details and the chain and everything about it really! or the cards. You have a wonderful way of putting things together. also intrigued with the little book necklaces.! Oh your work is beautiful! I love your stories of middle earth also. Although if I won your cards, I would not use them. i would frame them and hang them up. As for snow... I will send you some of mine, I just got a blizzard! Come see my blog too! I'm from Idaho and you can come take a peek at my BLOG anytime. Hello! Waving from the Pacific NW! We don't have any snow either :-( Just rain rain rain!!! Wow, wow, wow! I am so in love with Athelia, that Ihad to go over to your etsy shop and stare at all the necklaces you have there. The tiny books are fantastic. I love the textures and deep dark colors of your pieces. Amazing. I also love that you have tutorials. I was thinking of doing the papermaking one with my son, so it is cool to find one with so many photos! Thanks so much for the chance to win something so gorgeous! oh my....that is stunning! thanks for offering such a wonderful prize! What great things you make. They are very unique. Well done. I'm also in OWOH so pop on over if you like. I enjoy polymer clay, too, and love your pendant! So pleased to meet you through OWOH. Big hugs to you, my friend! Your pendant ist gorgeous! I'd love to win this lovely necklace :) Please enter my name into your draw! And pop over to my blog and enter mine, too, if you haven't done so already! Yay! OWOH is so much fun! I've followed your blog for a long time now. I'd love to win one of your wonderful creations! Oh how I do love your artistic talent and creativity. Everything you make is extraordinary. Hope you have oodles of fun during OWOH. I've enjoyed it so much over the years seeing all of the wonderful blogs and meeting everyone. Thanks for your participation in the event. Wow! Your work is so beautiful and original. The necklace is truly amazing! Hi Luthien, your work is stunning! Thank you so much for the opportunity to win one of your pieces of work! Hello Luthien and greetings from Arizona Usa. I am originally from Maine USA and they get a lot of snow there, trust me after a few days of having it you don't want it!! lol. But the first snowfall in a winter is a beautiful sight. Your necklace is so stunning you have a lot of talent!! I am loving your creations, and am now a follower! I was especially drawn to you book of Faith vs Fate!! come visit if you have time #630 on the list! I don't think I've ever visited your blog so it's very nice to meet you. Please include my name in your draw and it would be terrific if you could drop by my blog for a visit too. I'm sure I'll be back for another visit. Have fun!!! wow...you make some cool things!! It's great to look around here! this pendant-heart made my heart beat! So lovely! Lutien, Your work is simply exquisite! Please count me in. Your art is absolutely gorgeous... Please add my name to your drawing.. I now a follower and will visit often.. I love those cards! Wow...They actually look like some of my sculptures..Please add me to the draw and fly on oer to visit my blog at number 92. Hi Im Belind Nice to meet you .Love your Blog!! HElloooo from Texas Luthien!!! OOOOoo I just LOVE all your artwork! I would be thrilled to win some! The necklace is amazing! Hi Luthien. You have some really interesting things on your blog. I love the heart that you're offering as a giveaway gift. I'd be thrilled if I was lucky enough to receive it. A lovely nod to Tolkien. Please include me in your drawing. 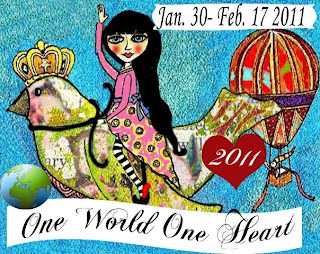 I am so excited to participate in my first OWOH blog tour . Your creativity is lovely. I hope I am lucky enough to win. Your prizes are so beautiful and generous! Please enter me to win. I would be so excited if you told me I won. Hello from New Zealand. I love your door prize. I adore heart necklaces. I'll be back for a better look around once I finish my OWOH tour. I'm at #226 if you want to stop by. Wow, what a stunning giveaway!!! I would love to be in with a chance to win. I love your work and have become a new follower. Thanks for visiting my blog and for taking the time to comment. I'm so happy I can be an inspiration to you-- well you are to me as well. Your door prizes and other art is awesome! I have accomplished a lot since I decided to seriously make my dreams a reality but the great thing it IS all about The Journey so where ever you are on the road is the right spot for now. So please try not to feel inept or bad in any way. Enjoy this time as it won't be back again! Hello from NY!!! What a wonderful giveaway. It is taking me days to go to each blog but I am having such fun visiting everyone. You have a lovely blog I'll be back! I admire at your jewelry work. Luthien, fitting name for an artist of such ancient wares...your work so moves me and catches my breath! and i thank you withal my heart for your lovely comments on my blog. i hope soon to list a few more of my daughter's pieces that they've recently made. the old gypsy woman you loved was made by my daughter mikaelah, when she was 18.
i do look forward to getting to know you more as the dust settles from this event...let's keep in touch!! I also have a 4 month old boy. He weighs 7kg already, so he is getting so big. Oh my my my! My jaw hit the floor when I saw your necklace! Stunning! I am soooo crossing my fingers right now! LOL! I enjoyed my visit at your inspiring blog. Please add me to your drawing for your beautiful prize. Stop by for a visit if you have the chance. What a delight you and your blog are! 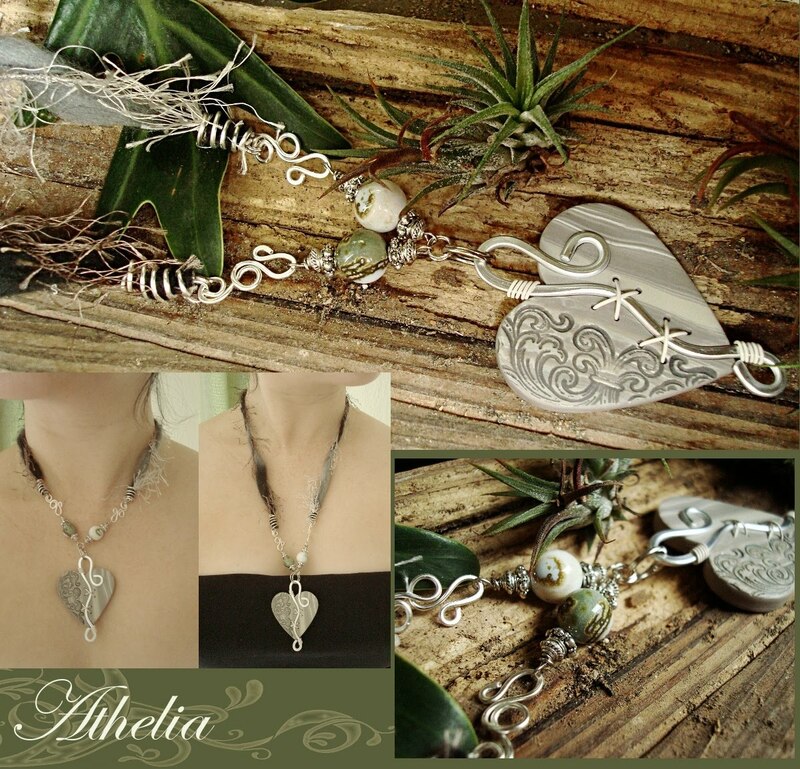 Your jewelry is beautiful and your altered pieces are fantastic! Please add me to your drawing and if you have a chance...come by and visit my blog (#561). You are very talented... Love both the necklace and the alchemy cards. Thanks for the chance at your doorprize! Oh Luthien, how wonderful to be offering such gorgeous pieces. I love them both! Please enter me in your giveaway. Hi Luthien!! I return the compliments to you--beautiful beautiful art and JEWELRY!! OMG! Ciao Luthien! I am so happy to meet you today on the wings of OWOH! Thanks for a chance to win your wonderful giveaway! Love, love, love the necklace and your and your cards are gorgeous! I don't think I'd ever take off that necklace if I win it! You can surely have some of our snow! Hello from Michigan!! Great giveaways. You are such a talented artist! I wish you well on your blog journeys. Your work is stunning!Thanks for a wonderful prize and so nice meeting you. Please visit Irish Muses at #678. Many greetings from the Netherlands! Hi Luthien, I enjoyed reading about you thank you for sharing such lovely things, please add me to your list, come and visit me if you can I am 250 on the list. Athelia is one of the most beautiful giveaways I've seen around! You do beautiful art. I'll have to check your etsy too. WOW, I think I am seriously drooling over your blog right now. So gorgeous! So much gorgeous eye candy! You are incredibly talented. Please sign me up for your lovely giveaway drawing! I found you last year blog hopping and Love your work, your pieces are wonderful, Please enter me in your giveaway. (#65) if you havent stopped by yet! love your blog and love your door prize.thanks so much for sharing with me. Hi Luthien, so lovely to meet you! Please add my name for your giveaway, I would so love to win either one of your delightful prizes:-) You do such beautiful work. Oh what a great blog and an awesome giveaway! Please enter me in your drawing. Hi Luthien, Thanks for taking the time to visit, I did notice your daughters name but wasn't sure if it was a misprint, I am curious what made you use a double L? I think Lara was an unusual name when we named our daughter she is 26 now nearly 27. I wish I had used the full Larissa though instead of the diminutive. Hope you drop by again sometime. Oh, your art is so beautiful! It´s so nice to meet you and your blog. And your give-away is lovley! You are most welcome to visit my blog and enter my give-away too. I´m at #532. I am loving your blog. I will come back later to read more posts. Gorgeous art pieces, lovely giveaway! Your work is amazing! It's been a delight browsing your blog. I do hope you come visit me at #769 during your tour. OK Luthien - what do I need to send to bribe you so that I win lol?? Gorgeous and very generous prizes, I know that whoever is lucky enough to win will treasure them. I would! Such a fair and inspirational space you have created here! And such truly beautiful treasures you create too! So much to inspire and delight. Thank you! I will certainly be back!! Good wishes to you and happy blogging. I love your necklace and hope to win it for myself. Please visit my blog and see my giveaways. Wow Luthien! You have a beautiful, inspirational blog! Your jewelry & journal work is so detailed! Please enter me in your giveaway and if you get a chance, please stop by my blog, Lost Coast Post (#455 on the OWOH list) Happy New Year wishes from Michelle in northern California! Ok this I can't pass up. Your work is so amazing.Please put my name in the draw. The combination of alchemy and Middle Earth is perfect for me. Your art would make any Elf smile! I love your designs. Please enter my name for a chance to win your giveaway. "The Year of the Cats"
WOW. WOW! Your necklace is breathtaking! The photography on the cards is pretty darned great as well. Athelia, I love your altered art. I find your Giveaway fantastic. I hope to win it. Please, visits me sometimes, OWOH #646. I am glad about your visit. Totally in LOVE with your blog. I had to become a follower. I am so glad to have found it! Please stop by mine. I know you would be able to use my giveaway in your art! Thanks for the chance of winning your beautiful, beautiful pendant Luthien (should I be so lucky, I need a long chain). The cards are fab too! What a generous giveaway! thank you so much for the chance to win one of these gorgeous prizes! The necklace is gorgeous and I love the cards! Nice to meet you Luthien ! First I took a few moments to discover your blog and i've browsed a while through your earlier and new posts. I LOVED your rustart series. Specially the "Fleur de Lille " My hubby is a scout leader for almost 35 years and the Fleur is also the Scout's symbol. It looked amazing !! Also your "Messy lil space" photos surprised me. A HUGE bravo your selfmade storage !! It was very enjoyable to read and discover your style and hobby .Thank you for sharing Luthien. About your giveaway; It would be a present to treasure and admirable that you have spent so much time on this gift !! I DO hope you ship and in meanwhile I keep my fingers crossed. I wish you a creative day ! Hi from the UK Luthian! and Creative Souls friend. You know I've been a fan of your stuff for awhile now. To win one of your door prizes would be amazing. Fabulous gifts. I think I will rest a while and wander round your blog. Please put my name in your draw and come over to my blog-#348 and try your luck there. Thanks and Good Luck! Hi from chilly England. Thank you letting me take a peek into your world. 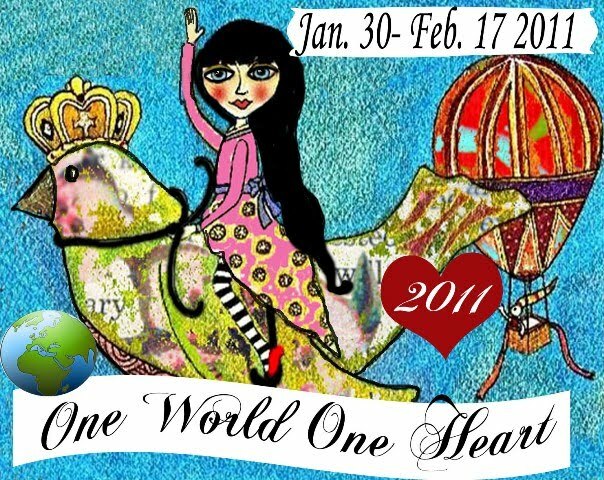 Love your heart - my fave shape, please count me in and if you get a chance pop by my blog #404 a warm welcome awaits! Greetings from western North Carolina. You have an awesome blog and giveaway- thanks for the chance to win! Hello from Canada, Luthien! Your work is stunningly beautiful! I love the lacing on the front of your book of fate. What a lovely idea to make art cards of your work! I hope if you have time, you'll stop by and say Hi, that is of course, if you haven't already! I love your art- it is so beautiful. I will be coming back to visit when I can stay for a bit to explore as I see some things that I like. Please add my name to your generous drawing and be sure to stop and visit me at lucky #777 on the list. Hi Luthien!! Nice to meet you! What gorgeous jewelry you create! And those cards are so steampunk! I'd love to be entered into your giveaway! Have fun with OWOH! You have a gorgeous blog and even more beautiful assemblages/mixed media pieces. I really enjoyed my quick look around. Please enter me in your giveaway and visit me, if you haven't already. I'm number 11 and my information is on my profile page. Hello Luthien. Thank you for welcoming me to your blog. Your creations are truly lovely and I've enjoyed this visit. Please feel free to visit me and enter my giveaway also. Just click on my blog link, or I'm %625. Happy OWOH to you! gorgeous art creations! both are so very pretty! so nice to meet you through this event. hope you'll stop by and say hi. so nice to see all of the wonderful creativity across blog land. PS ~ I'm another middle-earth dweller!! What a lovely giveaway you are offering. I love your blog and your work is wonderful, I especially love the miniature wearable book but everything is so lovely. I too am a dreamer who occasionally surfaces from my fantasies. It is fantastic to meet you here during the OWOH event. what does time and superman have in common? 200 stories from a faraway land..